This article is written by Sim Zhi Heng. 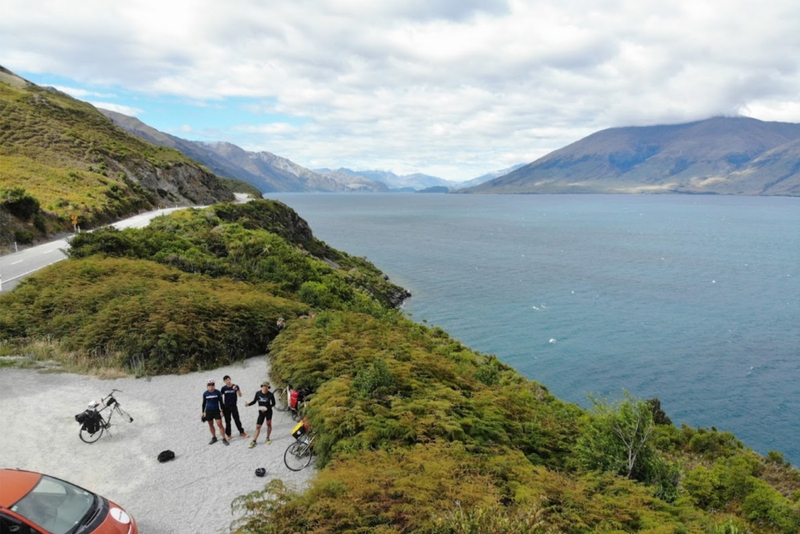 Cycling in the South Island of New Zealand was an enjoyable experience. She is blessed with world-class scenery, turquoise lakes, clear blue skies, and ice-capped mountains. Roads are also relatively quiet, and motorists are considerate. Some even winded down their windows and gave us words of encouragement. We didn’t have a fixed itinerary but just a rough planned route on Strava. The journey was supposed to be spontaneous, and the primary objective was to enjoy the company of friends (Zhipeng and Kai En) and have fun. We cycled 10 out of 25 days. The other days were spent rest days, hiking, exploring city, and visiting friends. We landed at Christchurch and assembled our bikes at Christchurch airport. It is quite impressive that New Zealand Airports have bike assembly areas marked out right outside the arrival terminal. 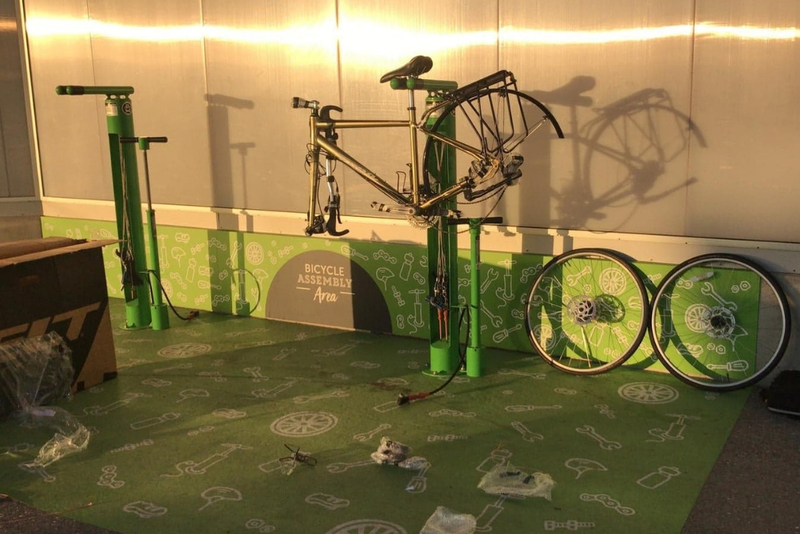 The assembly areas provided pumps, Allen keys and all the essential tools to assemble the bicycles. Warmshowers.org is a community of cycle tourists that offer hospitality to other fellow cycle tourists. 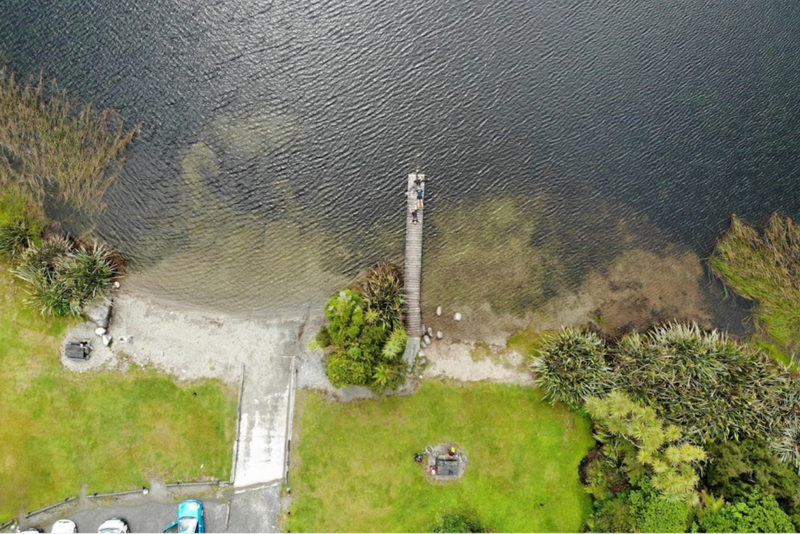 Warmshowers is not only a great way to get a shelter over your heads at zero cost but also provides an excellent means to interact with the locals and get a feel of what is like to live in New Zealand. It costs us an average of $30NZD (S$27.70) per person to spend a night at backpackers hostels. 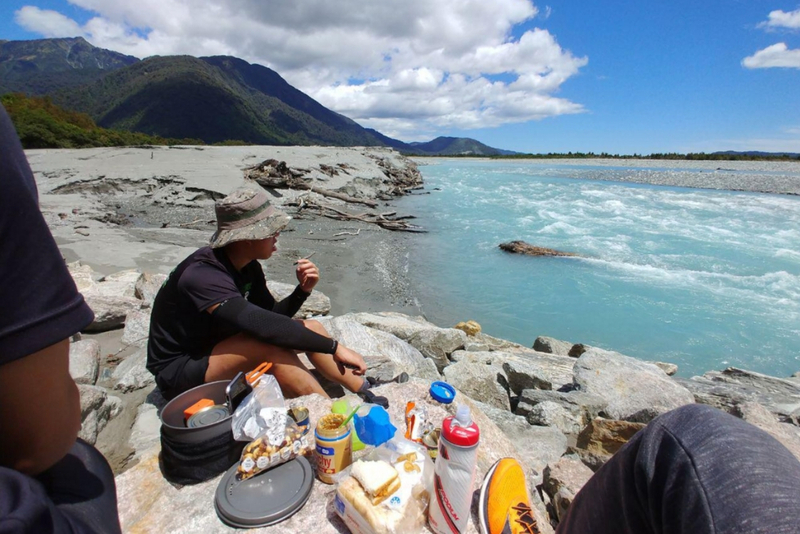 Sometimes, we would pay hostel lodges $10NZD (S$9.20) to camp at their lawns, and we could use their shower facilities as well as their kitchen which made things convenient. When staying in hostels, we would buy groceries and use their kitchens. Cycling in summer (Dec to Jan) also meant that the weather was warmer and the days were longer, ideal for camping outdoors. We were lucky with the weather; it only rained for two days out of the entire duration we were there. Furthermore, the low humidity meant that you would not get the sticky outfield feeling after a long day in the saddle, which also made camping here a much more enjoyable experience compared to back home in Singapore. DOC (Department of Conservation) Campsites are prevalent in many parts of South Island, and we used these sites whenever we decided to camp out for the night. We found the campsites through the offline Maps application: Maps.Me. We camped a total of 8 out of 25 days. Campsites varied from isolated spots near lakes (Lake Ianthe, Lake Paringa), to vast meadows (Cameroon Flats). If the campground had no shower facilities, we would go for a swim in the Lake to freshen up before changing into a clean set of clothes. 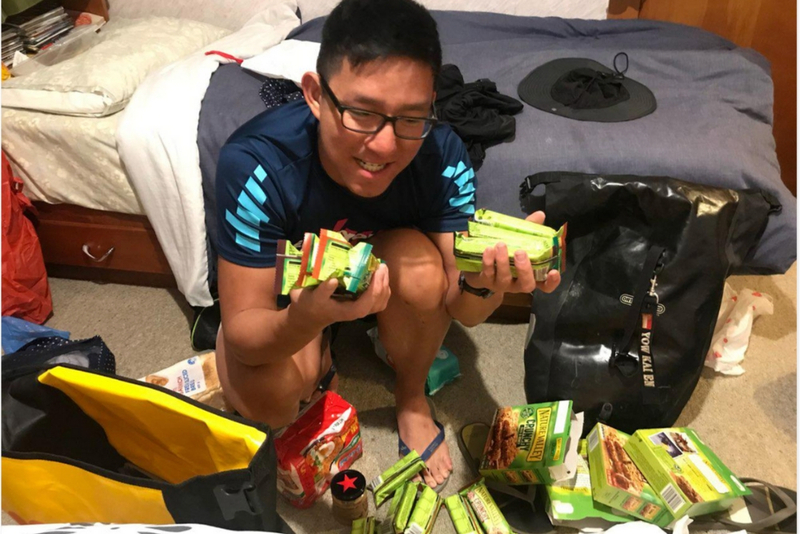 When we camped out, we would buy groceries such as canned tunas, Indomie, Uncle Ben’s fried rice (this is a packed instant rice thing which was quite legit and easy to cook), and Pasta. On the road, we had trail mix, energy bars, chocolates and Pic’s peanut butter sandwiches to keep the calorie intake high as we were burning lots of body fuel. Hydration was not much of an issue as the Kiwis are mostly happy to help refill our water bottles along the journey. In areas with sparse population, we often found streams of water away from cattle or sheep farms. We felt safe drinking water from these sources and never had any problems throughout the journey. 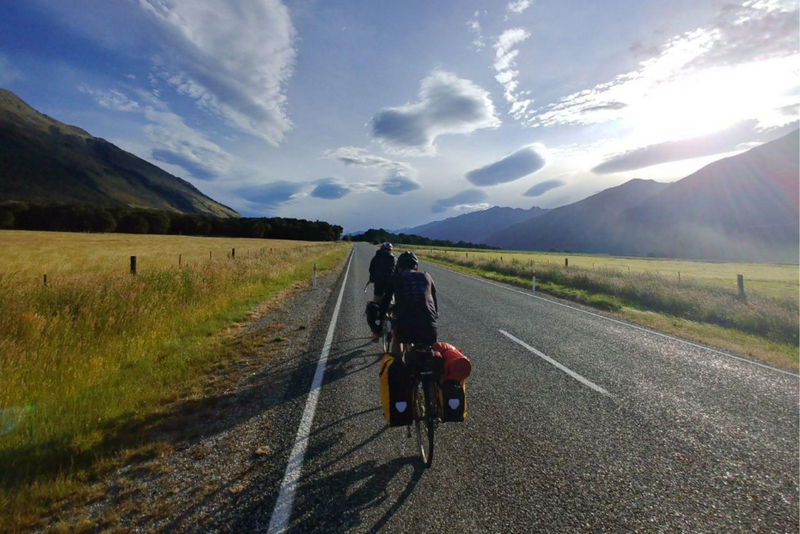 We decided to get a bus ride up Arthur’s Pass as the climb up Arthurs Pass (about 900m elevation) on the first day of riding did not seem like a good idea for the team’s morale. We took the West Coast Shuttles from Christchurch Bus Terminal along Lichfield St. Bikes were stored on trailers attached behind the shuttle, and it cost us an additional $10NZD per person. The first day was a “miserable” day as it rained at Arthur’s Pass. Getting our gears and clothes wet on the very first day of the tour was demoralising. We camped out at a DOC campsite along Bealey’s Spur for the first night. 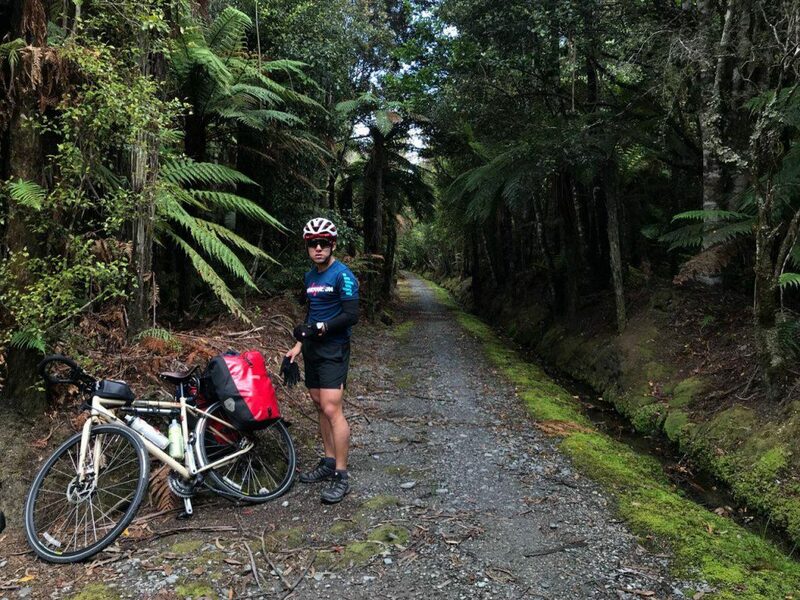 We had to cycle up some steep, gravel tracks, and hauling more than 30 kilograms (bikes + panniers) up loose gravel sections proved too much for my friend, Kai En, to handle due to inexperience and little conditioning. We also underestimated the climb and were lacking in food rations. 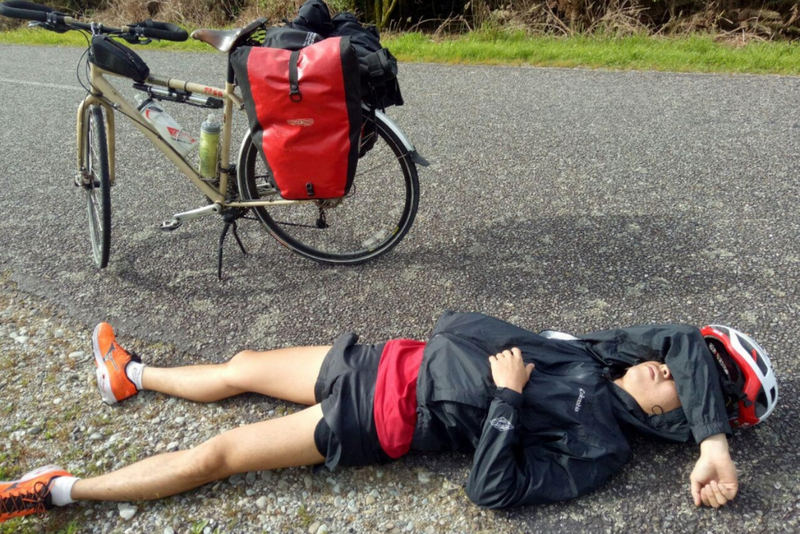 Kai En hit the wall with 20km to go and accepted a hitchhike offered by a local farmer into Hokitika. The initial plan to go round South Island had to be altered slightly. We decided to change our final objective to Queenstown instead. That day’s objective was to reach Lake Ianthe, some 70km away. It was thought to be a relatively simple day of flats. However, looking at the distance alone would be a mistake since we were loaded with 30kg panniers on our bicycles which would make the elevation much more difficult. Nevertheless, we headed out with an average rolling speed of about 21 km/h. We decided to make a 10km detour onto the West Coast Wilderness Trail. The trails were impressively well-maintained, which took us through the dense mossy forest of the west coast. The shaded path was a plus since the sun rays were unforgiving. Lake Ianthe was exceptionally beautiful, coupled with the clear blue skies and an amazing sunset. It made for a pretty awesome resting location after a long day on the saddle. Franz Josef and Fox Glacier are laid back settlements situated at the base of the glaciers, with Fox having a particularly good view of Mt. Cook, the highest peak in NZ. After two days of riding, we found ourselves in Fox Glacier for Christmas. The hostel that we stayed in was well-equipped with kitchens, laundry, etc. We even cooked up a steak dinner and had some wine to celebrate Christmas. 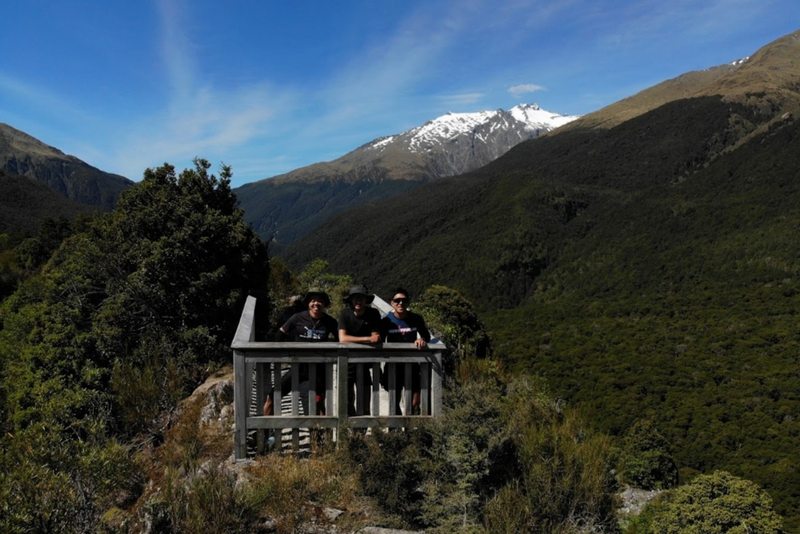 We spent Christmas checking out the nearby popular hike of Lake Matheson, following which decided to push 70km towards Lake Paringa. The ride to Lake Paringa was pleasant, with few cars on the roads and small rolling hills, it made for a pretty fun ride for the first 40km. Upon reaching Paringa, we were greeted with a host of campervans all cramped up at the campsite parking lots. The “CAMPSITE FULL” sign, signalled there were no more empty parking lots. 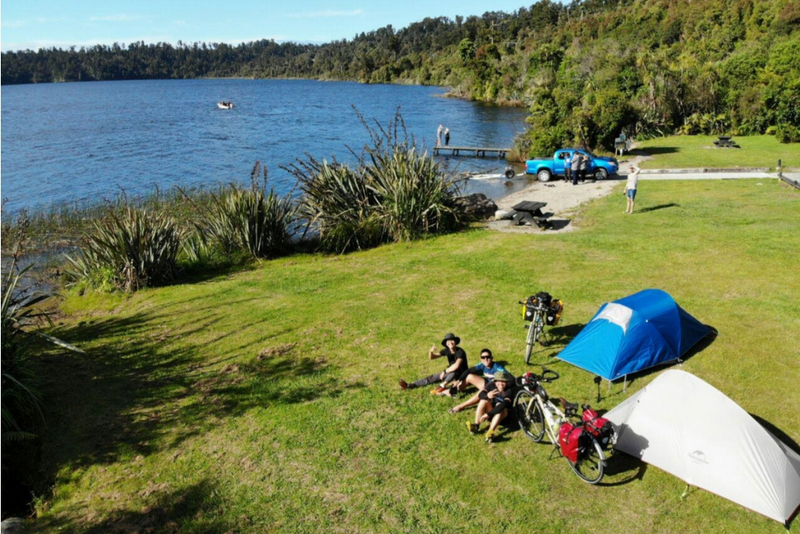 But we happily rolled past it (benefits of cycling rather than campervan-ing) and pitched our tents at an empty grass patch right beside the waters of Lake Paringa. 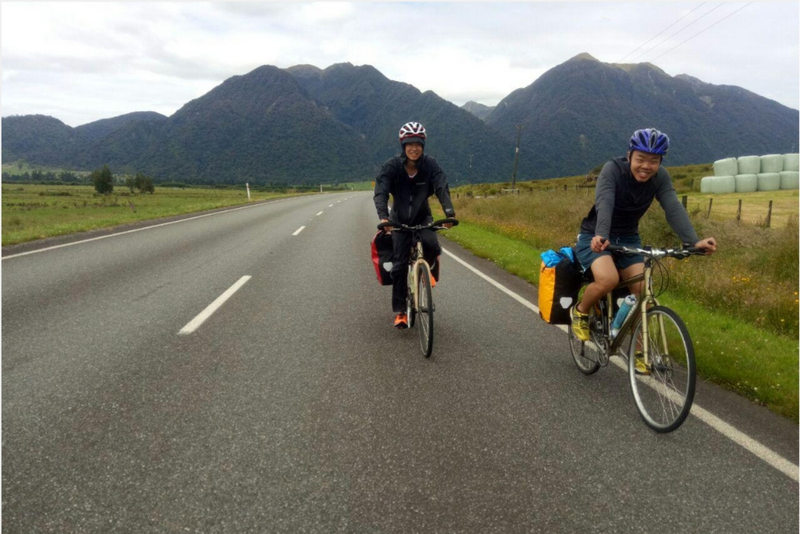 We rode towards Haast Pass after resting for a day in preparation for a day’s worth of climbing. 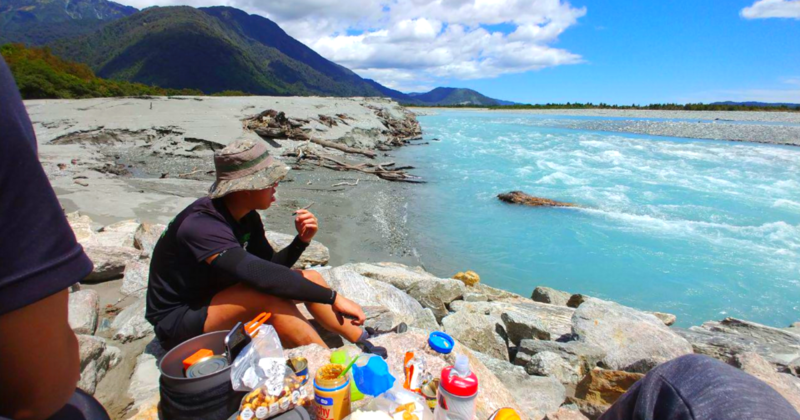 Haast Pass (564m) is one of three passes where a road crosses over the Southern Alps. The climb proved to be easier than expected, most likely due to our rest day, and conditioning after days of cycling. We also did cliff jumps at the famous Blues Pools near Cameron Flat campground. We camped out at one of the camper van sites in Makarora after stopping our ride. The camper van site had good shower and cooking facilities which made for a pretty pleasant stay. We continued on State Highway 6 towards Lake Hawea. This section was extremely beautiful as we cycled beside the large lakes of Lake Wanaka and Lake Hawea. 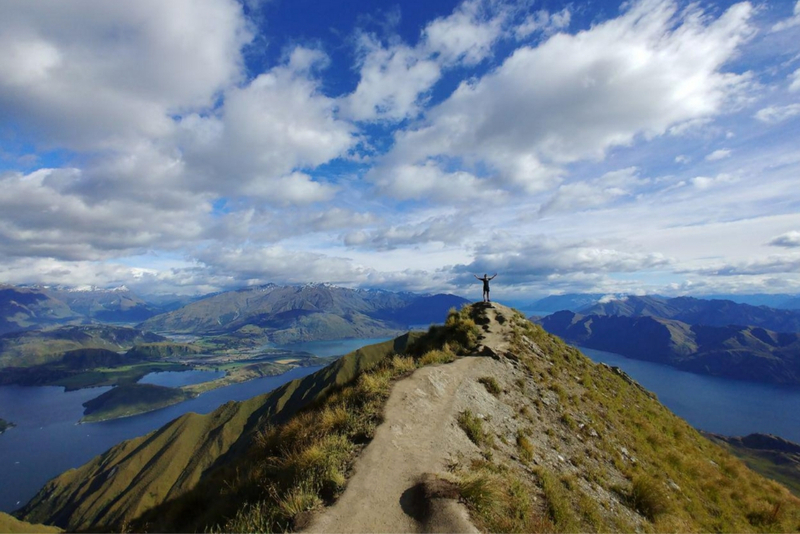 We spent New Year’s in Wanaka and did the iconic Roy’s Peak hike. 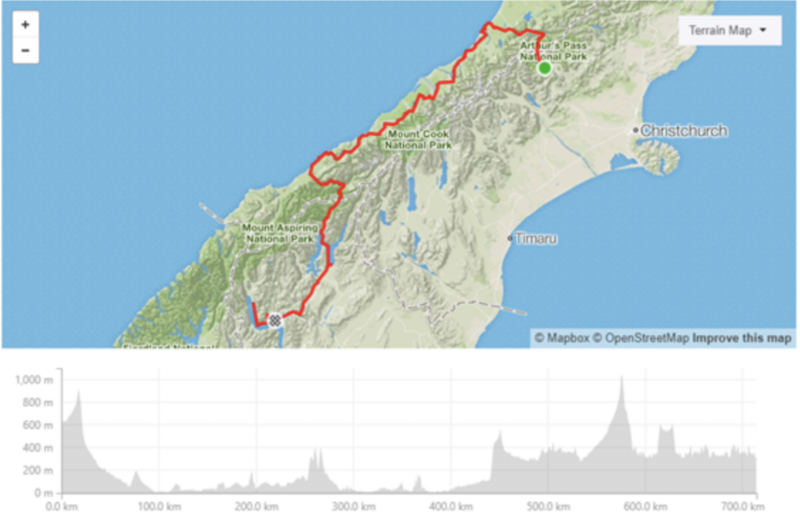 The last leg of the cycling trip was to cross the Crown Ranges, from Wanaka through Cardrona to Queenstown. Reaching an altitude of 1121m, this was the highest paved main road in New Zealand, and we expected a big day of climbing. After a 3-hour climb up to the top, we were rewarded with a descent which offered an excellent panoramic view of Queenstown which was where we were heading towards. 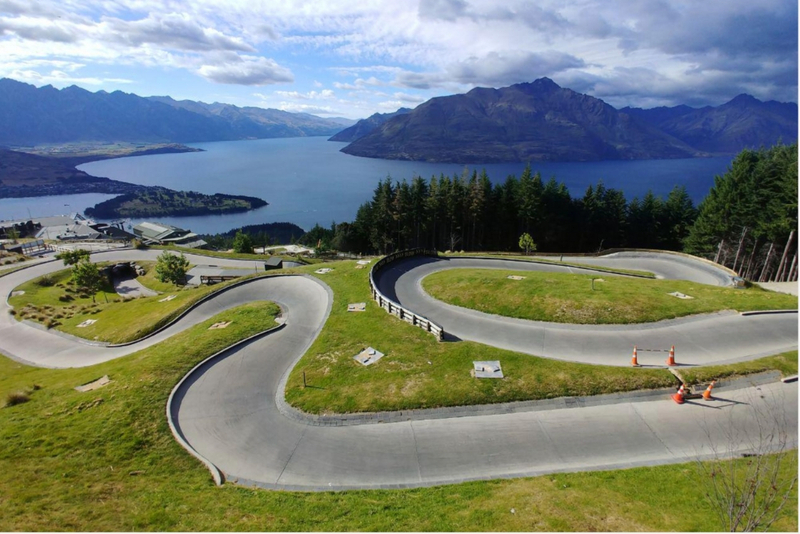 Queenstown officially marked the end of all cycling in New Zealand. We had five days to spare before needing to catch a flight out from Christchurch. Queenstown, touted as the adventure capital of the world, had a lot to offer. 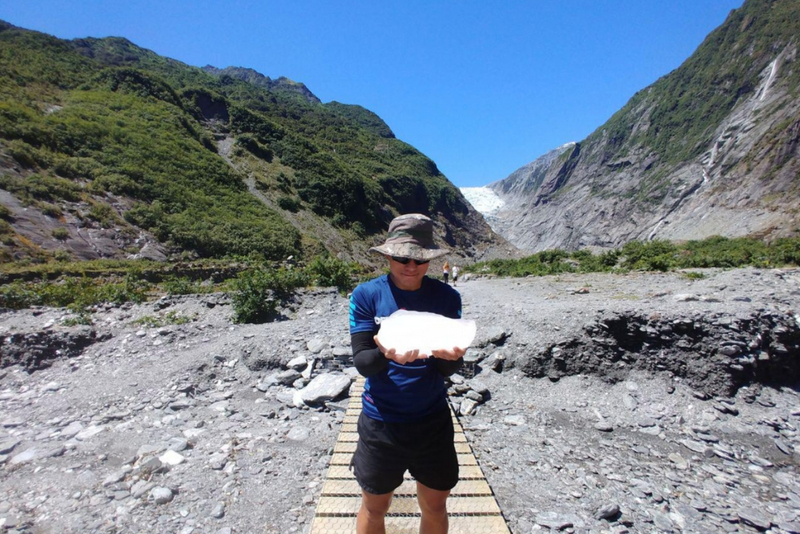 We decided to spend some cash on Skydiving, Milford Sound Tour, and Luge rides. We also hiked up the famous Ben Lomond which gave us incredible views of Queenstown and Lake Wakatipu. We booked a bus ride from Queenstown to Christchurch using Intercity. They were very happy to accommodate our bikes as luggage with an extra cost of $10NZD per person. Intercity buses had adequate luggage space to accommodate all 3 bikes, we only had to take out the front wheels (no cardboard box/bike box needed). Important to do test rides to test out gear and avoid mechanical breakdowns before going on a big trip like this. Important to couple cycle touring with other interest/ hobbies. 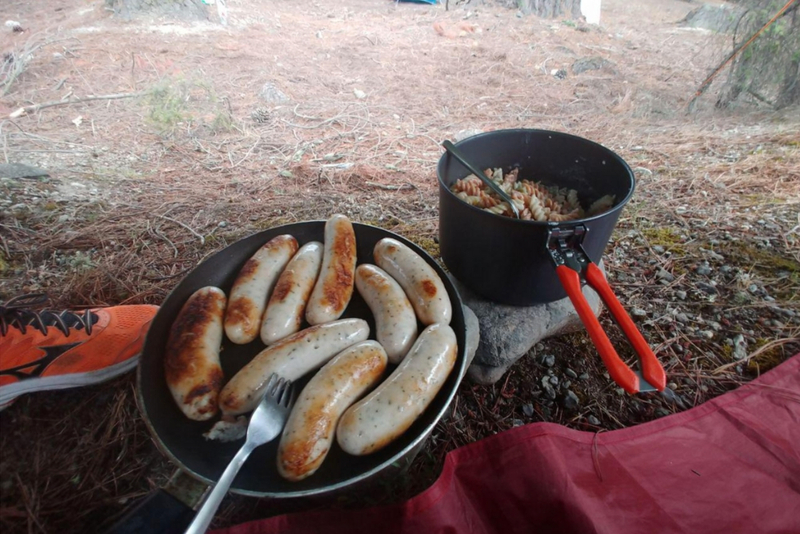 We took time off to do canoeing, hiking etc. Distance is not everything!! Enjoy the process. 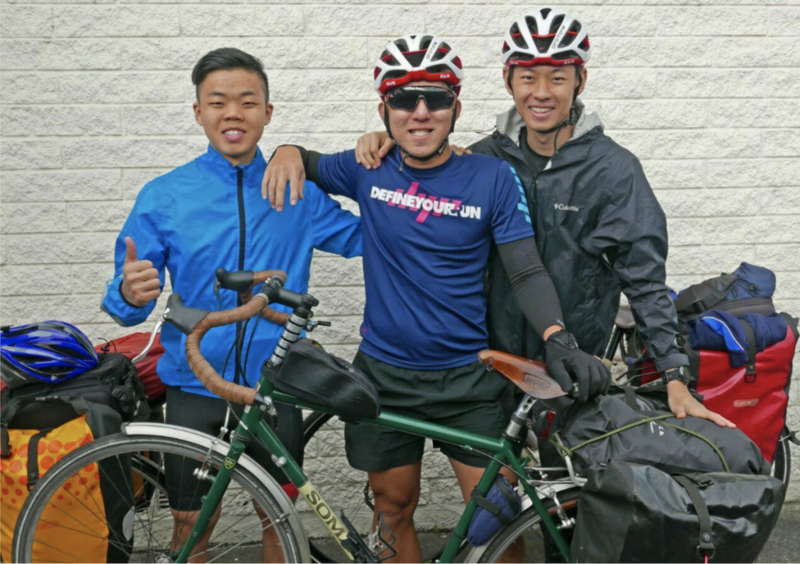 Do you have any overseas cycling experience that you would like to share with us? Do get in touch with us by sending us a message below!